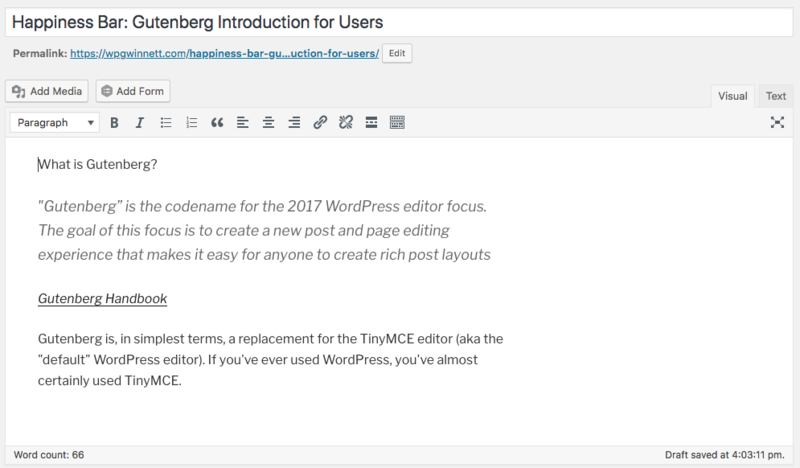 Gutenberg is, in simplest terms, a replacement for the TinyMCE editor (aka the “default” WordPress editor). If you’ve ever used WordPress, you’ve almost certainly used TinyMCE. Gutenberg uses “blocks” of content which can be arranged and customized to give users more control over how their posts and pages look. On the surface, it’s not unlike the editing experience of Wix, SquareSpace, and existing WordPress page-building plugins like Elementor. Install the plugin from https://wordpress.org/plugins/gutenberg/. Note that, at the time of writing, this plugin is not ready to be used in production (live) websites. Simply put, Gutenberg gives you more control over how your site looks than the current TinyMCE editor. As stated above, you can install Gutenberg as a plugin right now if you want to test it. Gutenberg is currently scheduled to be packaged as part of WordPress core starting with the 5.0 release. When is the 5.0 release? Well, we don’t know yet. At the time of this writing, there are some issues that could arise if you were to update your website to a version that includes Gutenberg instead of TinyMCE. Mainly, Gutenberg may break your editing experience if you are using a theme or any plugins which use custom fields to store and display content. It is up to each plugin and theme author to update their product to be compatible with Gutenberg. You could lose the ability to edit your content’s custom fields (because Gutenberg doesn’t use custom fields – it uses blocks). Install the Classic Editor plugin, which detects for the presence of Gutenberg on your site and circumvents it. Note: at the time of writing, this plugin is not ready for production so it would be better to make a note of it now and only install it if needed.